"Tomorrow/Bokra" song was released on 11.11.11 – a date chosen to highlight the ONENESS of the song and the hope that it would become a beacon of solidarity for the region. Funds raised through the global distribution of the single help in financing educational programs in music, arts and culture for children across the Arab world. 100% of all proceeds will be distributed to programs, with no administrative deductions whatsoever. 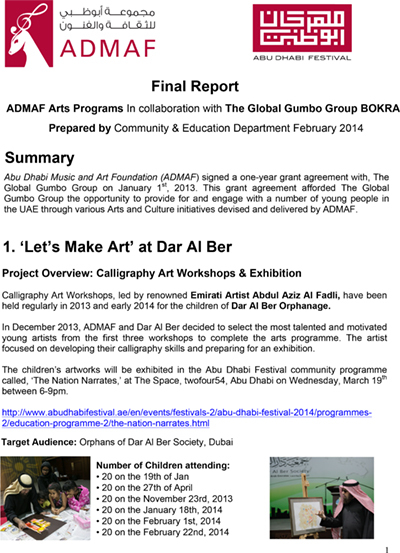 The Abu Dhabi Music & Arts Foundation (ADMAF) and internationally recognized charity, Save the Children (StC) were two beneficiaries who received support following the success of ‘TomorrowBokra’. 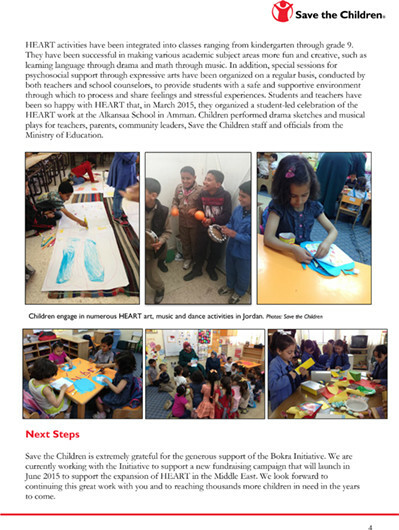 StC introduced 33 schools in the Middle East to the HEART program - Healing and Education through the Arts. In Jordan and Palestine over 4,000 children, 90 teachers, and over 450 parents were able to experience HEART activities for themselves, learning arts and activities they could nurture in their own communities.